Not all cardboard mug mailers are the same...Our mug mailers have been specifically designed to provide probably the best crush, smash, and impact protection for your mugs. Both our brown and white boxes are manufactured to the EXACT SAME SUPER STRONG IMPACT RESISTANT STANDARD. 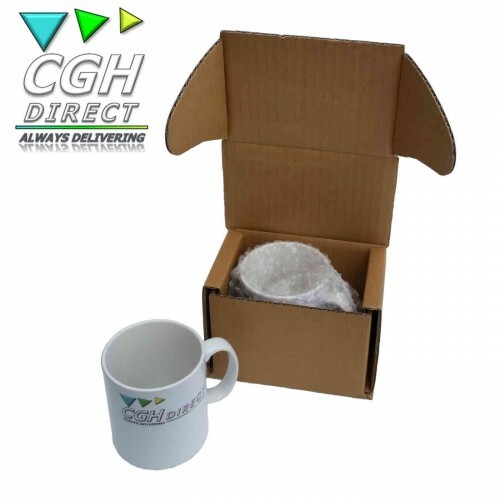 Ideal for posting...Our specially designed and tested cardboard mug mailers are one of the most inexpensive packaging methods available for posting promotional mugs or cups through the postage system. Smash, crush and impact resistant...With many years of packaging experience, we are confident the unique snug design of our mug mailers will offer exceptional smash, crush and impact resistance for your mugs. 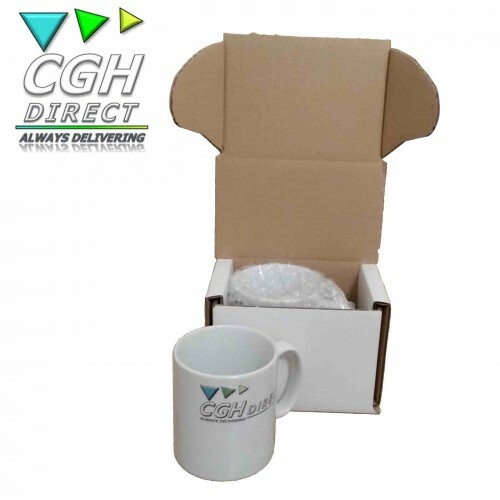 Perfect fit for 10oz, 11oz and some 12oz mugs...When placed inside the snug fitting cardboard mug mailer, the mugs inside are extremely well protected, due to the thickness and multi-directional strength of our design. Suitable for...Coffee cups, tea cups and mugs, including the most popular sublimation 10oz and 11oz standard style and popular 12oz Latte style mugs. Our cardboard mug mailers are suitable for cups and mugs up to 85mm in diameter, and up to 98mm in height. Simple and easy to use...Simply place your single mug into a suitable bubble bag, then place the mug upright into the mailer, then simply fold and lock the snug fitting lid in place. For extra protection and security we also recommend you tape around the joint. Important Note...We would never recommend you post your mug out in just a box. Always pack your mug in a suitable bubble bag or similar first, prior to packing in the box. Our boxes are available...Both with or without bubble bags included. Please see our other listings. Postage system tested...We have tested our mailers through the postage system, posting them back to our base from many different locations around the country. Including: South and North Wales, Yorkshire, South Coast, London, Scotland, the Highlands and many more, without a single breakage. 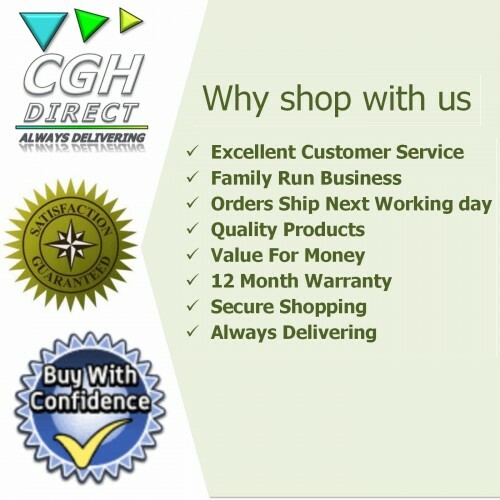 Free UK Mainland Delivery...We are happy to post to the Isle of Wight, Isle of Man, Scilly Isles, Scottish Highlands and Scottish Islands. However, please contact us first as there maybe an additional charge. Ideal for 10oz & 11oz mugs with large or small handles. Also suitable for popular 12oz Latte mugs. Cups and mugs up to 85mm diameter. Cups and mugs up to 98mm tall. Ideal for postage system and transport. Available with or without bubble bags included. Please note: Over or undersize mugs could effect the performance of the packaging. If unsure please contact us or request a sample. 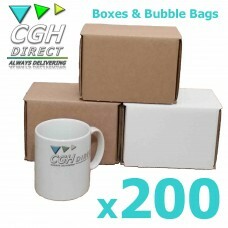 WOW 200 mug mailers & bubble bags for under £80 and with FREE P&P! We also sell Polystyrene Mug Mailers - please see our other listings. 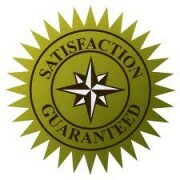 Please note: The images used are for illustration purposes only. Also note: The colour and packaging may vary slightly from these images. Also note: The mug(s) used in any images are for demonstration purposes only and are not included in any sale.